Kansas Smitty’s House Band are highly talented jazz outfit, with the aim of reimagining how their listeners experience jazz music. Comprised of musicians with a strong belief in pulling jazz into the present and handing it back to the general populous, this house band have successfully made jazz inclusive and less indulgent. With an emphasis on camaraderie, spontaneity, and joy, Kansas Smitty are an unmissable night-out for all music-lovers. This seven-piece outfit was brought together by American expat saxophonist Giacomo Smith. Coming from diverse backgrounds, this group is united by a passion for jazz tradition and musicianship From diverse backgrounds, this group is united by a passion for jazz tradition and musicianship. 2018 was a landmark year for Kansas Smitty House Band. 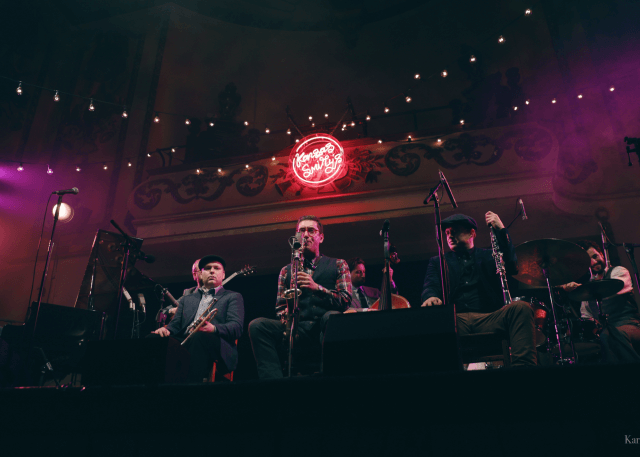 Its members were invited to play at world renowned venues, such as the Royal Albert Hall, Barbican, Boileroom and The Rose Hall at Jazz at Lincoln Centre. Recently, they were nominated for best UK Jazz Act by Jazz FM. 2018 also marks the third birthday of their East London music venue, Kansas Smitty’s. Interestingly, the concept of a jazz band owning its own bar was until now, unprecedented. Kansas Smitty’s venue has supported hundreds of great bands, providing a stage for them to showcase their music and reach new audiences. Kansas Smitty’s House Band cares as much about fostering the creation of new music, as it does in creating an incredible experience every time they take the stage. Today, the group continues to invent new sounds, with the aim of ensuring every single one of their shows are as fresh as the last.